Part of living creatively is thinking about design and visual appearances all the time. I enjoy cooking and I do a little creative cooking but on a very minor scale. I always consider presentation when I serve dinner. 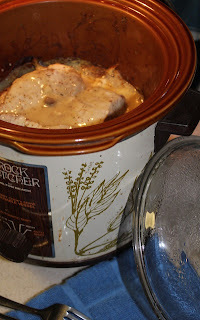 Last night I made a new crock pot recipe sent from my daughter for dijon pork chops. She noted that she was loving cooking in the crock pot because of her work schedule but that so many of the dishes, although delicious left a lot to be desired in visual attractiveness. As the recipe was cooking away I did a quick peek (generally a no-no with slow cooking) and she was right. This one was going to need some help when put on the table. It was all white. Even though I'd left the skins on the red potatoes it was white pork, white potatoes, white onions and white dijon sauce. To serve it I avoided my white dinner plates and decided to use my new pasta bowls with the gorgeous blue and green glaze. I also sautéed some fresh asparagus to combine with the main meal. 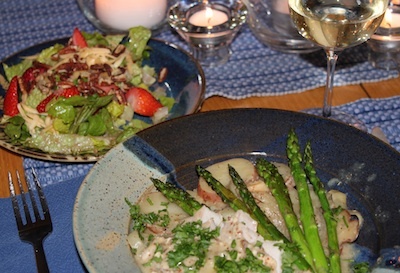 The presentation included the potato-onion-sauce mixture first covered with asparagus arranged in a fan topped with the pork thinly sliced and drizzled with more sauce and chopped parsley. I also added a romaine-strawberry salad to get some red into the meal. Added note: Wine and Candles make any meal look beautiful!